Verona Red has raised enough funds to produce and released their new EP Pound. The EP will feature seven new tracks by the band, and will be released on Feb. 4th. Here is some footage of the band putting the finishing touches on their new track "Kitchens". 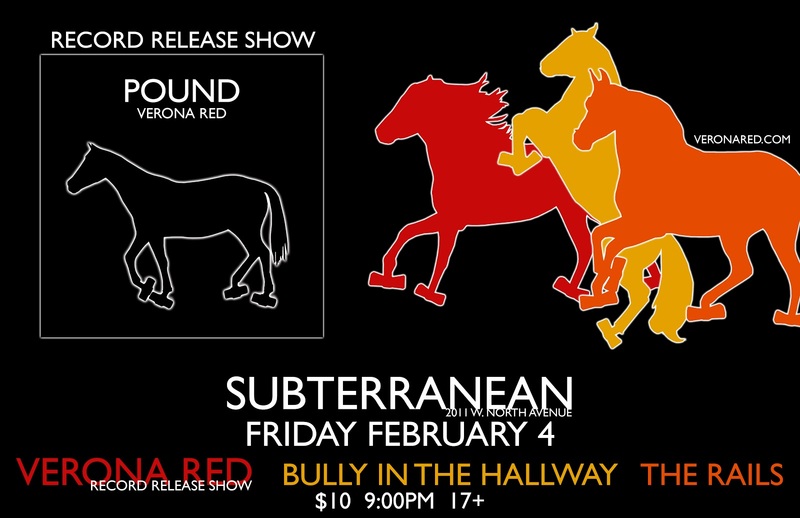 Verona Red is celebrating the release of Pound on Feb 4th at Subt with Bully in The Hallway and The Rails. If you're sick and tired of walking down the desolate streets of Hollywood, the scent of food trucks in Echo Park, or staring out into the Pacific Ocean dreaming of escape, then it's time to venture out to Pioneertown. We are teaming up with L.A. Record to present L.A. Folk Fest for a weekend of fun, bonfires, BBQ, and some good music! The event will take place at Pappy and Harriets, a mom and pop venue out in the desert with pool tables, cheap drinks, great food, and old-fashioned folk rock decor. The first time I ever went to Pappy's was to see Conor Oberst and The Felice Brothers play, and was blown away at how amazing the venue was, both sound wise and the overall fun vibe of the place. 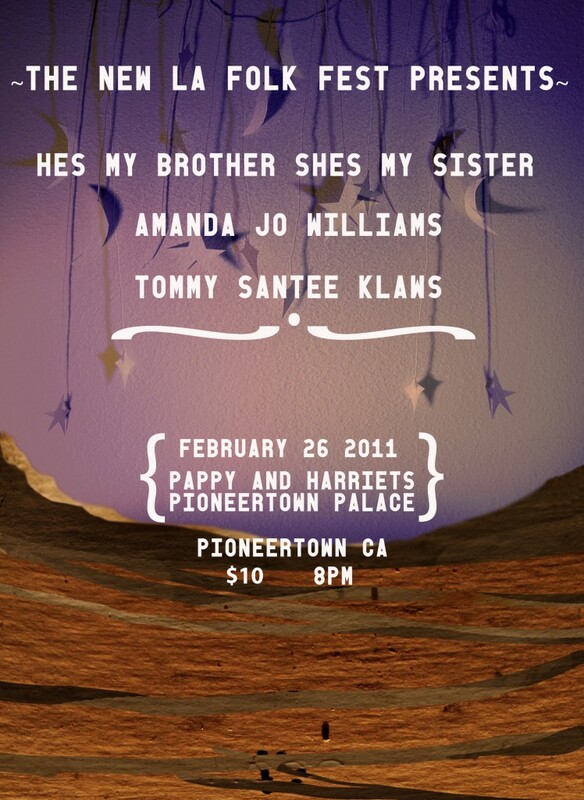 Folk, country, Western Swing....we've got it all with the lineup of He's My Brother, She's My Sister, Amanda Jo Williams, and Tommy Santee Klaws. The show is $10 and it starts at 8pm on Saturday, February 26th. I suggest reserving tickets ahead of time, as well as making a weekend out of it and booking a room at the hotel next to the venue(perhaps antique store shopping the next day?). E-mail lafolkfest@gmail.com to get on the "Weekend At Pappy's" RSVP list. Denton natives Sarah Jaffe and Bosque Brown will take hold of The Ghost Room this Friday in downtown Austin. Singer/songwriter Jaffe released her second album, Suburban Nature, last year, and received Rolling Stone recognition for her 2010 Austin City Limits performance. Don’t let Jaffe’s tender looks and blonde locks fool you. She possesses no fluff. Her song “Clementine” is an extraordinary find. Jaffe’s voice is wonderfully rich and wistful. She impressively crafts her words and sound with smoldering fervor. Folksy Bosque Brown (named after a river near Mara Lee Miller’s childhood home) will also perform at the spooky venue. Bosque Brown will perform at 9:30 p.m. Jaffe comes on at 10:30 p.m. Tickets are $10 at the door. Be sure to wish Jaffe a happy early birthday, too. The talented singer turns 25 on the 29th. Finally you can all vote for your favorite emerging DC/Baltimore artist of 2010 from the list on the right! I know, it's a long list, but that's what our jury of scene makers (see list below) passed us - there was hardly any consensus amongst them, they almost all voted for different artists, and that's why the list is so long. The band/artist from this list that wins on the poll's composite chart (i.e. jurors + Deli writers + fans' votes) will receive a plethora of prizes provided by the sponsors of The Deli. Right now all the artists in the list have accumulated some points from the votes cast by jurors and writers, now it's the fans and readers' turn! Here's the list of jurors in random order: Andrew Bucket (Velvet Lounge), Denman Anderson (AllOurNoise.com), Neal Becton (Som Records), David Hintz (DC Rock Live), Cale Jr. (BrightestYoungThings.com), Mark Mangold (Rams Head Live), Adam Savage (Sonar), Kelly Green (Asylum), Will McCrory (Recher Theatre), Steven Lambert (Rock & Roll Hotel), Jimmy Rhodes (Red Palace), Lisa White (9:30 Club), Matty (Sidebar), Chris Buresh (DCHeavyMetal.com), Reese Higgins (WMUC), Daniel Brindley (Jammin' Java), Dawn Reed (The Deli). After two years of traveling and playing shows, U.S. Royalty is finally ready to release their debut full-length album, Mirrors. I recently got a chance to sit down with lead singer John Thornley to talk about the record, his family, fashion and the ways we all connect with the music in our lives. Mirrors is scheduled to be released on January 25th. You can catch the band at Rock and Roll Hotel this Saturday, January 22. Doors open at 8:30.